Saba's quiet, isolated life with her father, twin brother Lugh and younger sister Emmi is turned upside down when a group of government troops called Tonton kidnap Lugh and murder her father. Vowing to find him Saba sets off in pursuit with unwelcome Emmi by her side. Battling the elements of a hostile environment and the evils of a future society gone horribly wrong Saba becomes a warrior, savior, and protector but above all she is a survivor. She lets nothing stand in her way including being imprisoned and forced to cage fight in a Roman-inspired, society-at-its-worst arena where she meets Jack, a fellow fighter and maybe love. Together with a group of female warriors who call themselves the Free Hawks they stage an epic escape and join together to find Lugh and just maybe take down the corrupt government along the way. This book did what very few books succeed in doing, it surprised me. I expected to like it, I didn't expect to love it. This is not your typical YA dystopian starting with the no-nonsense first person phoenetical narration of Saba which, although jarring, isn't as distracting as you would expect it to be and drives the relentless pace of the storyline. There is a corrupt government that must be taken down but the real theme of Blood Red Road is family, both the one you have and the one you make along the way and the lengths you will go to for someone that you love. Saba starts her journey in search of Lugh but along the way finds a connection with her sister, friendship and acceptance with a group of like-minded warrior women, and a love that teaches her the most important lesson of all, that you don't have to fight your battles alone. There are inevitable comparisons to The Hunger Games and if the producers of NBC's Revolution weren't in part influenced by this book I would be extremely surprised. 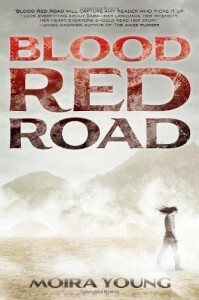 But, Blood Red Road has a greater sense of adventure than The Hunger Games not to mention a more fully realized romance and as far as I can tell no annoying love triangle. This is a brilliant start of an exciting new series, I couldn't pick up the sequel, Rebel Heart fast enough.